I remember when I was younger, one of the most terrific Yong Tao Fu in town was the Koo Kee Yong Tow Fu in People’s Park Food Centre. Back then franchise business wasn’t that popular so you need to travel a long way to eat really authentic food. Heck, back then even for Mcdonalds, there was only one in the east side of Singapore and it was at Paya Lebar near to Lion City hotel. Those were the days, of course times have now changed and good food are now ubiquitous because people can’t wait to duplicate workable business models. As they say, why reinvent the wheels, right? I am sure we have all seen it too often. 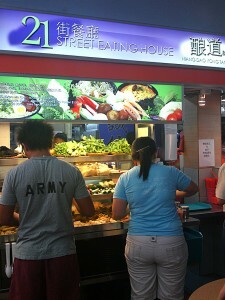 Famous Chicken Rice brand or Mee Pok Tah brand setting up branches after branches. After all if you can find someone who knows how to boil some noodles, then you would have set up another Mee Pok Tah stall, no? Truly it’s the same way how these American fastfoods can penetrate the global market so easily. As long you can find someone to fry the chicken then another KFC store is up. The good thing about franchising is that the public forever has to come to your brand for your authentic flavour and while you’re able to expand the business to cater to the public at large, your recipes will remain closely guarded. The situation in our local food has evolved because many hawkers nowadays don’t see themselves as hawkers but businessmen. Say if Mr Sanders( the guy who invented the KFC Original flavour) did not envisaged franchising his secret recipe but instead was just selling fried chicken from a little cafe, then you and I would never get to taste KFC. Therefore franchise is right because it paves the way for ‘institutionalization’ of recipes. But yet isn’t franchise means that food need to come out from the factory and isn’t thats what foodies fear the most because food standards usually drop this way. Lets face it, most of us half believe that factory food means run of the mill standard and for food like buns, real foodie must choose handmade ones over factory made ones anytime, agree? And those statements are true as far Koo Kee Yong Tow Fu is concerned. Since the mid 90s when the owner of Kee Koo Yong Tow Fu decided to franchise his business, the quality had dropped so much that their Yong Tow Fu can no longer satisfies me. I vividly remember the dao kee(beancurd roll) was one of the best in the old days with some authentic flavour that is so good that I would always order the $5 pure dao kee version. But it went from top marks to the negative during when they were expanding their business because they had to mass produce their ingredients which affected the quality a lot. Nowadays the quality they’re dishing out can’t really measure up when compared to the old days. But yet with the kind of natural disadvantage in mass produced food, Koo Kee Tong Tow Fu’s business is still thriving even as we speak. So the fact is that there is an advantage in business when exists a long and rich heritage that harks back to a glorious past even if the food is damn lousy afterwards. Well even KFC is doing the same thing so it must all be making sense though from the viewpoint of consumers, many are feeling quite shortchanged. So that’s why I am infact quite pleased that one my favourites, the Hakka Ampang Yong Tau Fu has always remain ‘unfranchised’. Hawkers are getting creative nowadays, take for example this particular Yong Tao Fu stall at Tampines St 21, instead of serving it in the old school way where Yong Tao Fu sauces are added onto your bowl of ingredients, they actually took the trouble to deep fry your ingredients to an absolute crisp and serve it on a plate for you. The good thing about this style of serving is that, once everything is deep fried again, it will taste as fresh as it can gets and as the sauces are served separately, you can dunk your Yong Tao Fu pieces into it like how you dip Dim sum into chili oil. Niang Dao Yong Tao Fu is trying to evolutionalise from the traditional way of serving Yong Tao Fu. 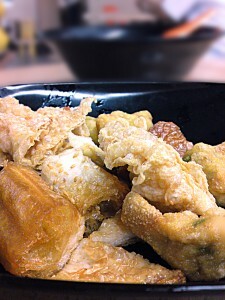 As you can see from the picture, those deep fried ingredients aren’t really your common Yong Tao Fu kind. Though it is outsourced from somewhere, you’ll be glad to know that it is not from factories but a Yong Tao Fu stall in the market nearby. For 6 pieces with choices of noodles or rice set, it will only cost you $2.90. On this occasional I took 10 pieces without any rice or noodles and I was charged for $3.60. I have to admit that all other common Yong Tao Fu ingredients are pretty standard kind so I didn’t bother choosing those whenever I ate there. But if you’re someone who is passionate about freshly fried food and have dreamt of the day where your Yong Tao Fu can be eaten freshly out of the deep fryer then this is it for you. Recommendation: All deep fried stuff. Conclusion: Freshly fried YTF at very affordable prices. Crispy pieces of YTF go extremely well with the sauces. Likes: Deep fried stuff and soup. Dislikes: Chilli not power enough. 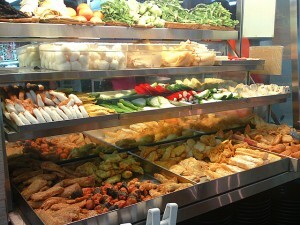 Can you help me to find the best yong to fu in singapore? when I am in singapore i quiet often eat yong to fu in takashimaya food court and very nice. I like to open in my country Indonesia so I have to find the good one.